The pronounced bias towards the Army within the Ministry of Defence (MoD) is casting its ugly shadow in the relations between the three services. The situation has reached such a pass that the three armed forces are eyeing each other with suspicion. The Union Home Minister Mr L.K. Advani, said here today that the security forces were having the ‘upper hand’ in countering terrorist activities across Jammu and Kashmir with a number of militants killed during the past three months. Prime Minister Atal Behari Vajpayee today came out strongly in defence of his political alma mater, the RSS, saying that the outfit should be judged on the basis of its conduct and regretted that the media ignored the sacrifices of the organisation. Addressing the inaugural meeting of the state BJP’s two-day session at the Digha sea resort, Midnapore, about 250 km from Kolkata, the party’s all-India President, Mr Jana Krishnamurti, said there was no threat to the stability of the Vajpayee government. The mother of six kids killed them and committed suicide at Chakahlebad village under the Mushahri police station in Bihar’s Muzaffarpur district on Thursday. Family members standing by the bodies of six villagers who were massacred by extremists at Mataurha village, under Masaurhi police station, in Bihar on Friday. 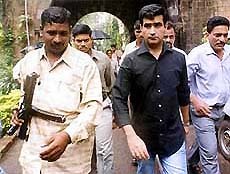 Film actor and prime witness in the Gulshan Kumar murder case, Kishan Kumar (centre) arriving at the Sessions Court in Mumbai on Friday. 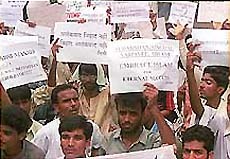 Members of the Students for Islamic Movement in India (SIMI) demonstrating in New Delhi on Friday. A delegation of the Malta Boat Tragedy Probe Mission, led by its Chairman Balwant Singh Khera, met the CBI chief, Mr P.C. Sharma, here to demand action against persons responsible for the 1996 Malta boat tragedy in which 283 persons, 170 of them Indians, were killed. Faced with the anti-incumbency factor, the ruling BJP-led coalition government in UP is now trying to indirectly split the minority vote in its bid to regain power in the state. The Tamil Nadu Government has decided to enact a legislation banning sale of chewing tobacco, “paan masala” and “gutka” products as the use of these was on the rise even among schoolchildren. Mrs Leslie Readwin of Britain was in India recently to recall her memory and see the famous tigers of Corbett National Park, which nestles at the foot of the Central Himalayas. The 80-year- old was very keen to meet the majestic cats in their natural surroundings. But unfortunately she had to return without seeing even one. Members of the sub-committee for the Maharaja Ranjit Singh bicentenary celebrations today inspected the work on the statue of the Sher-e-Punjab, which will be installed on the premises of Parliament in November. The sun rose today on a promising note for Ms Madhu Arya, a 42-year-old from Karnal who is diagnosed with a 100 per cent disability of lower limbs. The stagnation in the decline of the Infant Mortality Rate has led the government to introduce schemes like the National Nutrition Mission. Eight persons have been awarded life imprisonment by two local courts in two cases. Licences of six ration depot holders have been cancelled on the recommendation of a District Supply Officer investigations the sugar scam worth lakhs of rupees in the Bhadra tehsil of the district. A lot of bad blood has been generated between the three services in the past few months over various issues, including the handing over of ‘strategic weapons’ to the Army. Serious cracks which have developed in the armed forces on its reorganisation with specific reference to the proposal of having a Chief of Defence Staff (CDS) are now spilling out into the open. Allegations and counter-allegations are flying like uncontrolled missiles seeking to destroy the very ethos and apolitical character of the armed forces with the government and Union Defence Minister Jaswant Singh turning a blind eye to the worsening state of affairs. Charges are being levelled that self-seeking senior service officers with the backing of senior mandarins of the MoD are seeking to thrash out policy matters in full public gaze. In the eye of the storm is former Minister of State for Defence Arun Singh who was specially appointed adviser in the MoD purportedly at the behest of Mr Jaswant Singh during Mr George Fernandes regime as Union Defence Minister. With Mr Jaswant Singh now holding additional charge of defence portfolio, there is hushed talk in the MoD that Mr Arun Singh is functioning as an “extra constitutional authority.” It is suggested that Mr Arun Singh’s bias in favour of the Army would be detrimental to the overall interest of the country’s security interests. Senior officials in the defence establishment are concerned that everytime Mr Arun Singh has been around the differences within the three services, especially the Army and the Indian Air Force (IAF) have widened. It is no coincidence, they emphasise, that when Mr Arun Singh was the Minister of State for Defence during Rajiv Gandhi’s Prime Ministership that the IAF’s opposition to creation of the Army Aviation Corps, diluting the air strength, was overruled. And now IAF’s contention against handing over of strategic weapon system like Agni-II (a nuclear warhead delivery vehicle) to the Army has been dismissed without taking into account that such weapons all around the world are in control of the strategic air forces. Besides, sources say that the report carrying details of the reorganisation of the defence forces is heavily tilted towards the Army with the claims of the IAF again being ignored. It is in this context there is fresh consternation that Mr Arun Singh yet again headed the task force created for reorganising the defence forces. Incidentally, Mr Arun Singh’s style of functioning — regularly convening the meeting of the three service chiefs and having access to the secret files — was raised in the Lok Sabha yesterday during zero hour by Congress member Priyaranjan Dasmunshi. He also alleged that Mr Arun Singh was working as an “extra constitutional authority”. The sources say that in handing over Agni-II to the Army, a decision said to be primarily taken by Mr Arun Singh and seconded by Mr Jaswant Singh, the MoD had overlooked that the Air Force was considered a strategic force and had the capability of delivering strategic weapons with accuracy from hundreds of miles away. The IAF has also been opposing the creation of the CDS and instead has been demanding a “strategic command force” under its control which would provide the platforms (planes) for delivering strategic (nuclear) weapons. Among the three forces the IAF is the only one which has been studying the issue over the years and has submitted a detailed “air delivery deterrence” report to the government. In handing over Agni-II to the Army, the MoD has taken a decision which amounts to putting the `cart before the horse’, according to senior officials and defence analysts. Considering the odds, sources said the IAF was fighting with its back against the wall to keep its assets secure. Defence experts are worried about the turn of events in the MoD and stress that the government should not create a wedge between the three armed forces in best national interests. Mr Advani told reporters that the militants had been able to kill innocent people by aiming soft targets, but maintained that the security forces were having the upper hand in countering them. It is difficult to get early results in a proxy war than in the open war, he said referring to the case of Israel and the UK where such operations were more open. The overall improvement in Jammu and Kashmir could be gauged from the fact that over six lakh tourists had visited the state during the past three years which was much higher than their number during the past 10 years, Mr Advani said. Reiterating that Kashmir was an integral part of India, Mr Advani said New Delhi maintained this very stand during talks with Pakistan President Pervez Musharraf at the Agra summit. Mr Advani said India was always willing to have a dialogue with Pakistan to resolve contentious issues but blamed Islamabad for aiding and abetting the killing of innocent people in the valley in the name of ‘jehad’. “The yardstick for measurement of the Sangh should be on the basis of its conduct”, Mr Vajpayee said at the launch of a book “Setubandh” (bonding) authored by the BJP General Secretary, Mr Narendra Modi, and late Raja Bhai Nene here. The book is based on the life and works of RSS swayamsewak, Lakshman Madhav Inamdar, populary known as “Vakil Saheb”. Calling for a change in the attitude of the media, Mr Vajpayee said the RSS received little attention from the media in comparison to those pertaining to Christian missionaries. Mr Vajpayee lamented the fact that while several RSS workers fell to militants bullets in Tripura no news were emanating from there, similar incidents in the case of Christian missionaries received wide media attention. The BJP-led NDA government at the Centre would run for five years despite the opposition by vested interests and other divisive forces, he asserted. Mr Krishnamurti urged all party workers to get united and fight against communal forces and other vested interests which were hampering the normal functioning of the government. He alleged that a conspiracy had been hatched to discredit and dislodge the Vajpayee government. He, however, was confident that the Prime Minister would foil all such attempts. He was hinting at the Tehelka issue and the UTI scam. He demanded that all partners of the NDA should work together and help Mr Vajpayee to fight against all obstacles in the paths of the country’s progress and prosperity. Mr Krishnamurti commended Mr Vajpayee’s role at the recent Indo-Pak summit and wanted that further talks between the two countries should continue in order to solve the Kashmir issue. But the ISI’s activities in the country and cross-border terrorism should also be discussed, he said. The BJP President reiterated that Ms Mamata Banerjee could be allowed to re-enter the NDA only when she was ready to strictly abide by the alliance’s code of conduct. Sayda Khatoon mixed pesticide in the food that she took along with her six kids. The family was facing hardships because of financial crisis. Mohammad Hadiq father of the kids, used to pull rickshaw in Delhi, police sources said. Villagers said Hadiq had shifted to Delhi and used to pull rickshaw there. But his earning was too meager for the family of eight. He had come back to his village 10 days ago and had gone outside the village when the tragedy occurred. Mr Khera told the CBI chief that even a detailed list of the deceased had not yet been prepared. 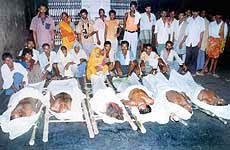 While the government agencies had about 80 names, Mr Khera said, the probe mission had identified 102 victims. The mission demanded that all necessary information should be collected regarding the suspects in the case, who belonged to 11 countries. There was also a proposal to put such information on the CBI website. Mr Khera said compensation should be claimed from the shipping companies which were found to have committed lapses resulting in the tragedy. He said income sources of travel agents operating in Punjab should be probed and cases registered against those having income disproportionate to their known sources of income. First, the party aligned with Ajit Singh’s Rashtriya Lok Dal despite intense opposition from Haryana Chief Minister Om Prakash Chautala, whose INLD has been extending unconditional support to the Vajpayee government at the Centre. And, today, the All-India Imam Association led by its president Molana Sajid Rashidee has extended support to the RLD. The support extended by the Muslim organisation is significant as this community constitutes 40 per cent of the population in western UP. The Jats, the traditional vote bank of former Prime Minister and late kisan leader Choudhury Charan Singh, whose son Ajit Singh is trying to consolidate his father’s legacy, constitute a significant proportion of the population in the 22 districts of western UP. Rashidee, whose organisation had earlier extended support to Samajwadi Party leader Mulayam Singh Yadav, told a joint news conference here today that his organisation would support the RJD in the Assembly poll scheduled to be held early next year. The 5.5 crore electorate of western UP send 138 legislators to the 408 member UP Assembly. The minority vote bank in the state swung from the Congress to the Samajwadi Party following the Ayodhya movement. Faced with the prospect of poor electoral performance the BJP is indirectly trying to split the minority vote bank to minimise its losses. The leader of the Imam’s association said they would also contest some of the Assembly segments. However, he did not state in how many constituencies they would put up their candidates. Rashidee said an appeal would be issued to all Muslims to support RLD candidates. Asked whether the association would urge members of the community to support the BJP with which the RLD had a tie up, the Imam did not give a direct answer. He said: “We are only extending support to the RLD,” indicating that the association and the RLD would be entering into a seat sharing arrangement with the BJP and there would not be any direct contest between the BJP and the RLD. RLD leader and Union Agriculture Minister Ajit Singh said the issue of Harit Pradesh would be the main focus of the party during the poll. On his part Mr Chautala has been addressing rallies in the region for a separate state and had expressed the party’s determination to contest the upcoming Assembly elections in UP to extend his image as a kisan leader outside Haryana. The tiger is dying out at Corbett, a park that was created with the very aim of preserving the region’s tigers. Mrs Readwin was born in India and was a teacher at the nearby Nainital hill station when she was young. It was during that time that she met the legendary tiger hunter Jim Corbett (after whom the park was named) when he had come to deliver a lecture in her school. Jim Corbett was an Englishman who lived in India during the days of the British. The Kumaon Hills, which are now part of the newly formed Indian state of Uttaranchal, were his hunting grounds. In his world famous book “The Man-eaters of Kumaon,” Corbett described how he hunted tigers which preyed on humans instead of wildlife. He could be a ruthless hunter, but he loved the wild animals and killed only those who were man-eaters. Finally, one day he decided to give up hunting and established Corbett National Park in 1936. Established as a place of refuge for the striped cats, the park has been a favourite with both tourists and serious tiger-watchers. Leopards, crocodiles, monkeys and jackals also live in the 1,300 sq km national park and its surroundings. The tigers are there, too. It’s just that no one is sure how many there are. Estimates vary between 100 tigers and less. Expert opinion says that less than 3,000 tigers may be left in India today. India accounts for nearly half of the world’s tiger population living in the wilds. The government’s attempt to protect the tigers resulted in Project Tiger, which was launched in India way back in 1973. The project protects tigers in more than 20 national parks. But it appears that this has not done much for the nation’s tigers. The rate at which they are being hunted down even today, when hunting them is banned, they may all soon be extinct. Poachers have killed more than 120 tigers in India since the beginning of the 21st century. They sell tiger bones for medicines, which are bought by gullible villagers to allegedly boost potency. Angry villagers whose cows and goats have been hunted by the big cats sometimes pay poachers to kill tigers. Authorities at Corbett Park recall paying compensation to local farmers whose cattle have been killed by tigers. As India’s population is increasing, the tigers and many other endangered animals are being pushed into a corner. Forests, the natural habitat of tigers, are being raided for their resources or are being cut down to make way for human habitation. Tigers in turn are being forced to move out of forests in search of food and begin to hunt domestic animals in neighbouring villages. This in turn attracts the wrath of the villagers. It’s a vicious cycle no one seems to do anything about it. Those who inspected the work at the workshop of sculptor Ram V Sutar at “Anandvan” near Surajkund included Mr Sarvesh Kaushal, the Special Principal Secretary to the Chief Minister, Mr Kuldip Nayar, Rajya Sabha member and chief architect of the Punjab Government. The members had a long discussion with the sculptor on the progress of the work, an official note said here today. Apart from the statue at Parliament complex, two statues will be installed — at Ropar and the Ranjit Sagar Dam complex — to preserve the memory of the Maharaja for posterity. The members were assured at the workshop that the first statue would be delivered by the end of October, another by the end of January and the third by March 31. Kumari Adimuthulakshmi from Chennai, who suffers from 75 percent disability of the lower limbs, is confident that she is on the threshold of a new beginning. Mr Jitendra Upadhyay from Rajasthan is a social worker. His disability does not prevent him from working for polio eradication and spreading education. Today he sees himself inching forward with a new zeal. These people are among the 30 orthopaedically disabled persons who were presented specially designed motorised triwheelers (MTW) by the Rajiv Gandhi Foundation to mark the 57th birth anniversary of the leader. The motorised triwheeler scheme was started by the foundation in 1992 to help deserving but disabled individuals from across the country. About 200 persons have been provided the triwheelers since the scheme was first started. The stagnation in the decline of the Infant Mortality Rate has led the government to introduce schemes like the National Nutrition Mission. Stating this, the Union Minister for Health and Family Welfare Dr C. P. Thakur, said : “When the country is having excess food stocks it is surprising that anaemia and malnutrition are a major threat to the health of people in the country”. In one case, Mr Chander Narayan Mushar, Additional District and Session Judge (Fast Track), awarded life imprisonment to Rajpal, Hukam Singh, Ghan Shyam and Kaluram Oard of Khunja. According to the prosecution, the four on the night of January 21, 1998, attacked Chhotu Ram of Khunja, when he was going to work, with sharp weapons. On way to hospital, he died. In another case, the Additional District and Session Judge (I), Mr Om Parkash Gupta, awarded life imprisonment and a fine of Rs 2,000 to Ashak Ali, Darshan Khan, Kale Khan and Usman for beating Hakam to death on June 11, 2000. Mr J.P. Chandellia, District-Collector, has ordered a probe. Mr Harbhajan Singh, District-Supply Officer, carried out the probe and found that about 800 quintals of sugar worth lakhs of rupees was abandoned in the tehsil. A dealer got about 553 quintals from a wholesaler for the gram panchayat of Nethana, Munsari, Dobi, Kanau, Milisisar, Kunji and Geha but failed to distribute it. Five other dealers also got 246 quintals of sugar but die not distribute. Licences of the six dealers found guilty in the probe have been cancelled and the Enforcement Officer of Bhadra has been ordered to register a case against them under the Essential Services Act. A departmental action will be taken against the tehsildar of Bhadra, Ram Singh, the transferred Enforcement Officer, Prahalad Singh, and a clerk, Rameshwar Lal.